Velvet, woven in silver threads. Received in 1935 from the History Museum, Moscow (formerly in the P. Shchukin collection). 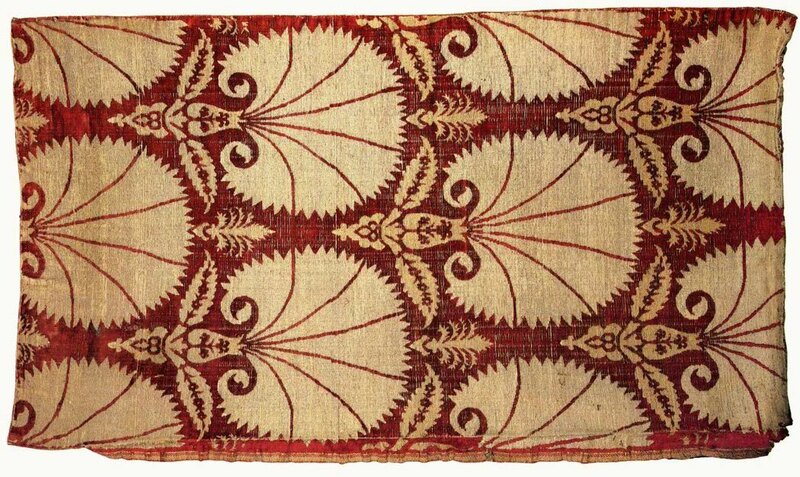 Turkish weaving had reached its acme by the middle of the 16th century. The velvets and silks from Bursa (a suburb of Istanbul), Uskudar (Scutari) enjoyed a world-wide fame. They were admired for, among other qualities, an extraordinary variety of designs. The latter were dominated by floral motifs. They were usually quite large, summarily treated and stylized. The commonest ornamentation of velvets featured stylized fruits, pomegranate blossoms and carnations woven in silver threads. Particularly popular were large pale-coloured carnations, or "fans", against a dark-crimson background. The fabric shown here is an excellent example of this type of design. Received in 1919 from the Art and Industry School (formerly the Stroganov Art School), Moscow. In 1514, Sultan Selim, who had defeated the Safavids' army and conquered the capital of the Safavid kingdom Tabriz, chose a thousand best Iranian potters there and brought them over to Istanbul. Some of these potters settled at Iznik (the ancient Nicaea) which soon became the centre of Turkish pottery-making. The wares produced at Iznik won a rapid recognition. They were made only for the court, and it was forbidden to sell them to private individuals. Turkish pottery is extremely multiform. Its fragile and porous sherd was first covered with white engdbe, then painted and finally glazed. Ceramics made in the first half of the 16th century were dominated by various shades of blue, but from the middle of the century onwards the colour range became more varied and included red, bright green and other colours. 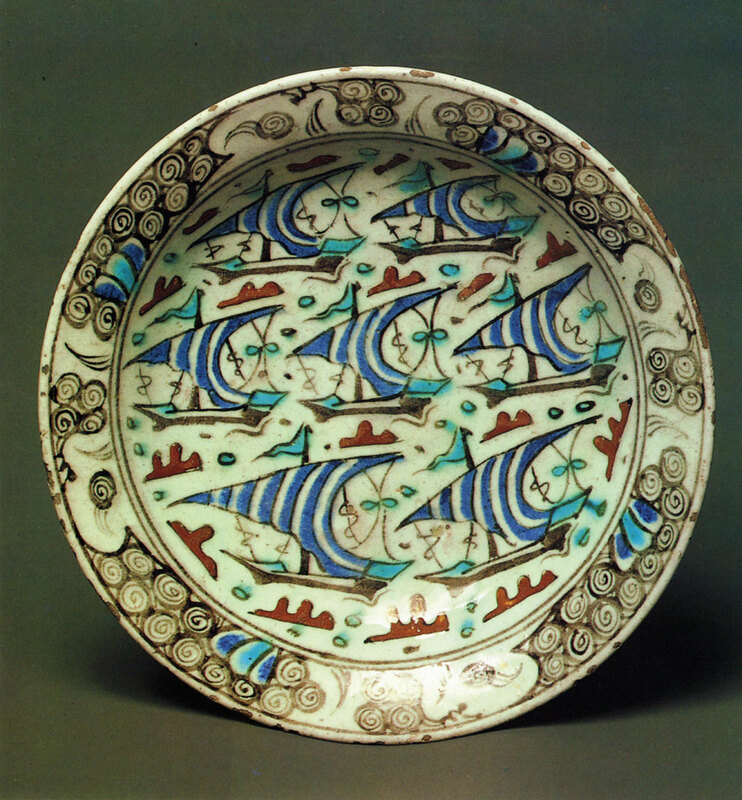 The dish reproduced here is painted with boats in full sail against a white background. The design is characterized by a complicated composition, a clearly drawn outline and a restrained colour scheme.